The University of Milan (UMIL) is a public teaching and research university, which with 8 faculties and 2 schools and a teaching staff of more than 2000 professors, is distinguished by its wide variety of disciplinary fields. A leading institute in Italy and Europe for scientific productivity, the University of Milan is the largest university in the region, with approximately 64,000 students; it is also an important resource for the socio-economic context of which it is a part. As a Partner of the EDEN2020 Consortium, their collaboration and on-going work is vital to the success of the project. The veterinary research group of UMIL is composed by Prof. Davide Danilo Zani, Prof. Fabio Acocella, Dr. Stefano Brizzola and Marco Trovatelli. The group focuses on the study and validation of the steerable catheter and of the robotic system. Their aim is to study the feasibility of the system through an animal model, and is based on the quantitative assessment of drug diffusion and the extent of brain damage. Furthermore, the aim of their work is to understand and find any discrepancies between the theoretical framework of the system and of its actual clinical application. 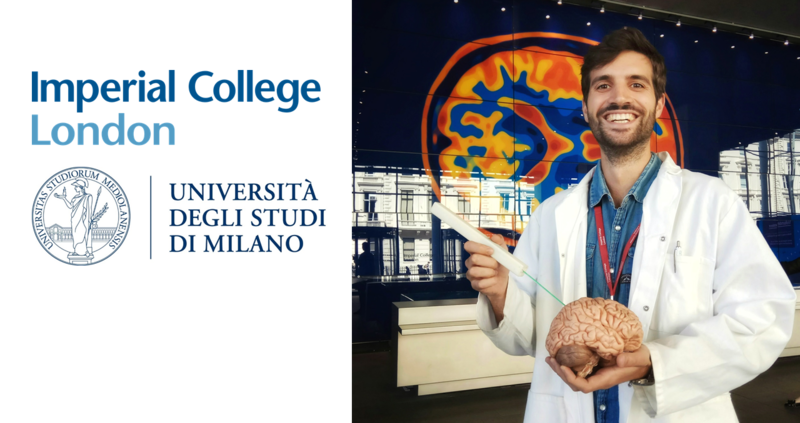 This is carried out in close collaboration with the unit of Neurosurgical Oncology of UMIL, Università Vita-Salute San Raffaele, Politecnico di Milano and Imperial College London (IMPERIAL). ‘I graduated from Università degli Studi di Milano (UMIL) in Veterinary Medicine in 2016. After my degree I decided to undertake a PhD in Animal Science at UMIL as part of the EDEN2020 project. As part of this project I am now working at Imperial College London in the Mechatronics in Medicine and Tribology groups, led by Prof. Ferdinando Rodriguez Y Baena and Prof. Daniele Dini, respectively. Here I am actively employing several technologies (e.g. a FIB SEM) to understand and assess the extent brain damage at the cellular level. This includes a comparison of surface damage when using a rigid catheter compared with the steerable one, the extent of damage to the blood brain barrier and the inflammatory immune response after insertion of the catheter. This work is carried out by Andrea Bernardini, a PhD student at Imperial College London who is developing a finite element model of the brain, and myself. On top of this, I am collaborating with Dr. Riccardo Secoli to optimise the surgical system based on clinical evidence and technical needs. On a personal note, my experience here is enabling me to collaborate with fantastic people, both from a professional and human perspective, where team work and multidisciplinarity are highly encouraged. As a European funded project, we aim to continually increase knowledge sharing and understanding throughout the Consortium and beyond. Marco’s visit to the IMPERIAL team has provided a unique opportunity to do this and we look forward to expanding our collaborative efforts going forward. This project has received funding from the European Union’s EU Research and Innovation programme Horizon 2020 under grant agreement no 688279.